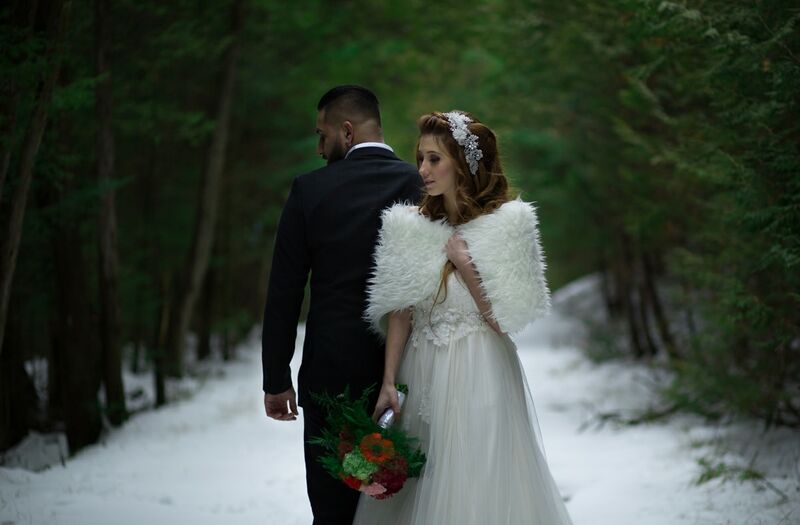 This winter wonderland wedding photo shoot was an amazing opportunity to work with an adventurous couple and some inspired vendors. 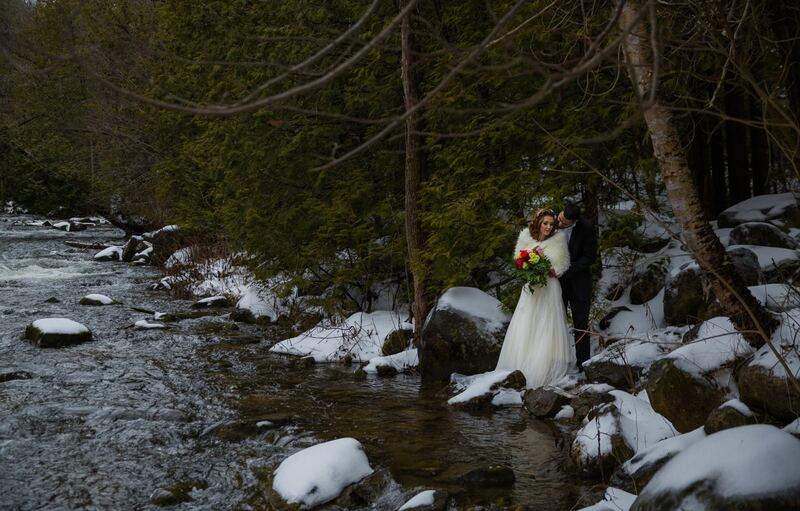 Our inspiration for this photo shoot was the beautiful Canadian landscape in winter. As Canadians, we tend to hibernate for the winter and only explore nature and the outdoors in the summertime. 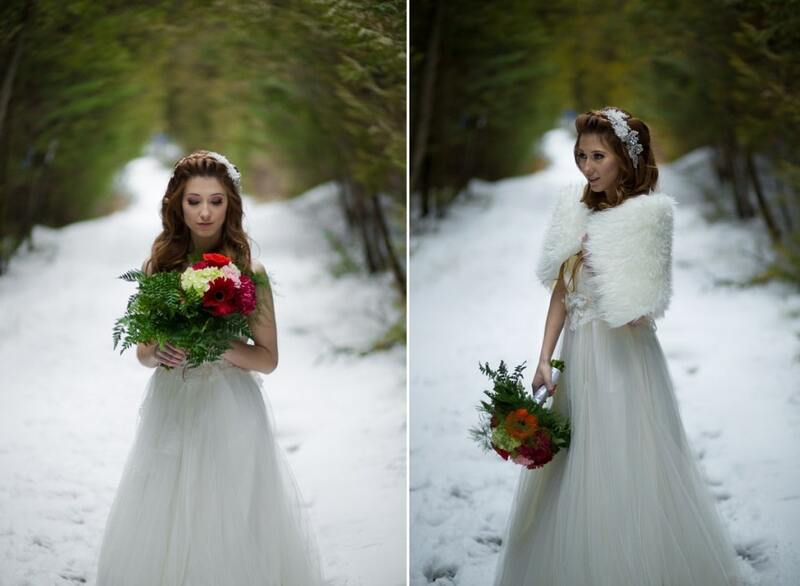 This means we miss out on the beauty of snowy outdoor photo shoot locations. 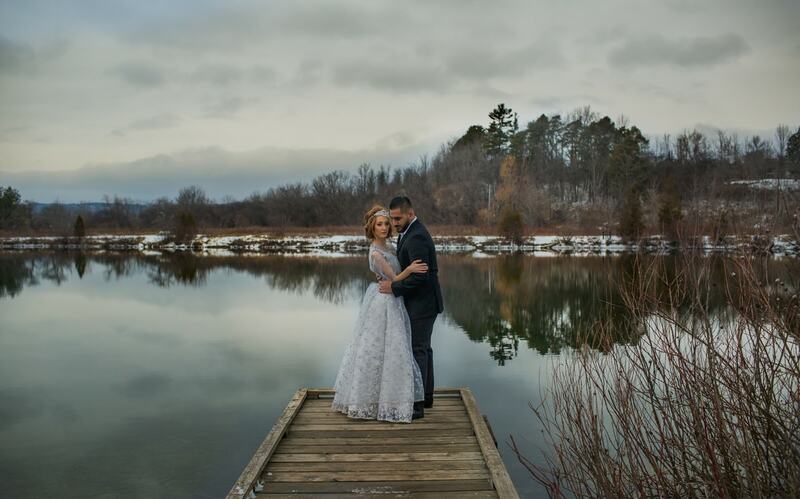 By doing this photoshoot, we wanted to show our acceptance of the Canadian winter and to take advantage of the natural scenery available to us. 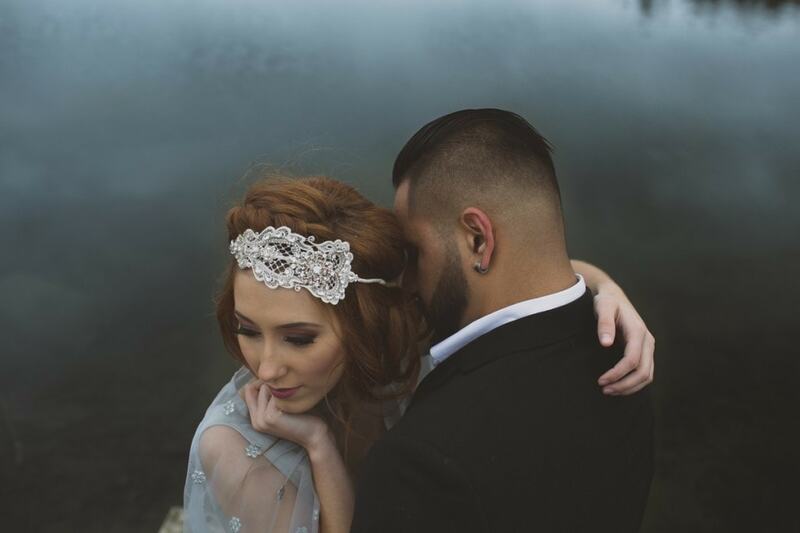 With all the amazing landscape this country has to offer, we couldn’t help but be inspired in adorning Daria and Sunny for this photo shoot and capturing these magnificent images. The couple’s sense of adventure made them a remarkable pair to photograph for this shoot. Daria was not afraid of being a little cold, and neither she nor Sunny hesitated moving down to the waters edge in order to catch the perfect shot. 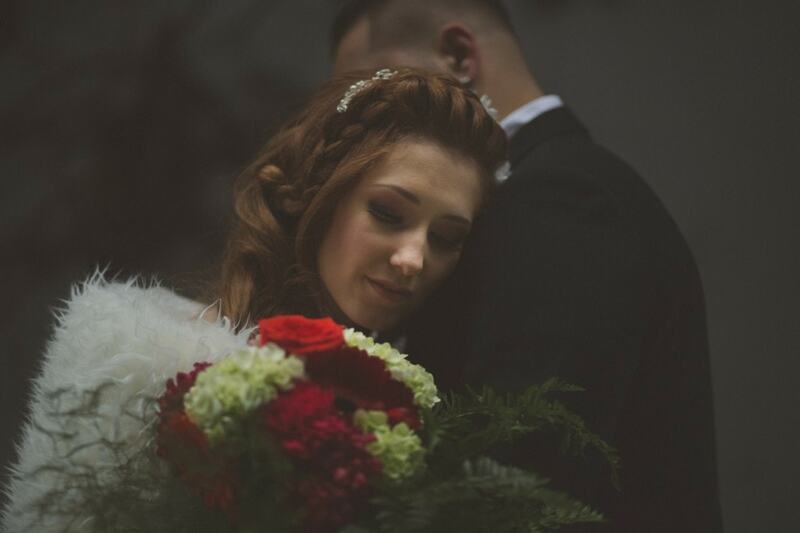 The magical thing about a winter fairy-tale concept is the contrast this cold, snowy backdrop provides for the couple’s chemistry: you can feel the warmth of their embrace in the icy chill of winter. Sunny and Daria were not afraid to be close in front of the camera (though the cold may have helped!) but you could feel their connection even when they were apart. Bring some one for help. It’s hard moving enough moving around in the snow so the extra hands are very helpful with tasks such as straightening out the wedding dress. Wear warm shoes! No one will see your shoes under your dress. So pull on your comfiest, warmest boots for getting around in the snow. Similarly, add extra layers under your dress such as a pair of warm tights. Stay warm. Take breaks after 15 minute sessions to warm up. Bring a thermos of coffee or hot chocolate. Make your breaks as long as you need to feel comfortable continuing. Warm winter accessories can add a touch of glamour. Consider adding gloves to your outfit, or a stole like the fur one worn by Daria. Keep the bottom of the dress clean and dry by standing on tarp or a garbage bag. And, as with any other photo shoot at any other time of the year, remember to have fun! We want to say a special thank you to everyone who made this photo shoot happen. Without you, your creativity, and your willingness to collaborate, we would not be able to capture such stunning images!